While Chinatown, Little India, Little Tokyo and Korean Town cater specific ethnics, expatriates, (as well as Bangkok people,) Little Arabia focuses mainly mid-eastern expatriates and tourists. 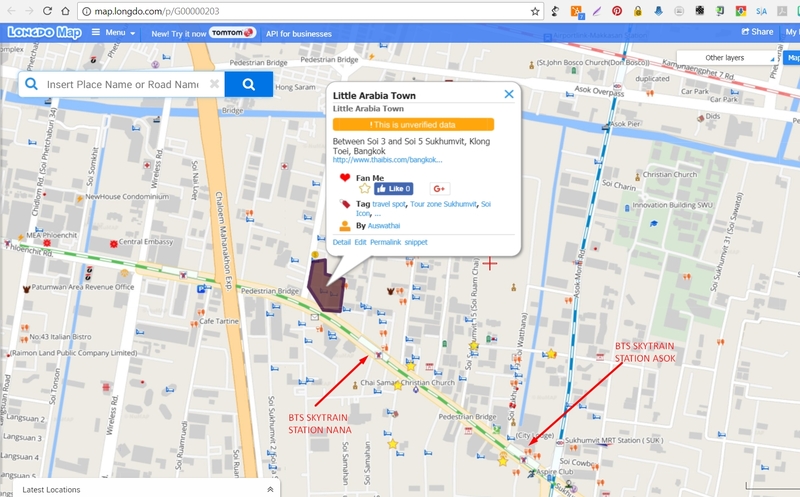 Little Arabia is hidden between Sukhumvit Soi 3 (Nana) and Soi 5. The community abounds with people in mid-eastern clothing making its hidden location noticeable from afar. Little Arabia caters mid-eastern people and tourists with travel services, air-tickets, accommodations, etc. For Bangkok people, it is known as the hub of African and Islamic food. The restaurants in this district are open 24 hrs per day to go after a night out, although they do not serve alcohol. This area is Bangkok's all-in-one place for cuisines like Lebanese, Turkish, Egyptian, Indian, etc. If you want to try these like some Bangkok people do, Little Arabia's vast choices is the best in the city. No website, review below "Get the most use a Host" > Bangkok P.A.C. Small cost Big Smiles! Many amazing authentic styles of kebabs and kiosks and restaurants selling fresh Kebab in pita bread. The fresh Kebab meat in pita with your choice of sauce is very affordable, and it tastes fantastic. Normally the Kebab stand has both beef and chicken freshly sliced from the rotisserie. The cost of a Kebab is only 60THB(less than 2USD). One of the main attractions at any of the restaurants in this district are the Shisha Pipes. The Shisha Pipe, is basically a water pipe that is used to smoke flavored tobacco. The health risks involved in smoking from the Shisha (Hooka) Pipe, are widely debated. Some say it is safer than regular tobacco, and others say it is more dangerous. I can say it tastes and smells a lot better than cigarettes. There are a wide variety of Arabic foods available, including seafood, Kebabs, breads and anything else you can imagine. The menu at one of these restaurants may look like an encyclopedia. The prices of food in this area can be a little on the high side, however the food is truly authentic. One of my favourite dishes is the "mixed vegetables stuffed with minced lamb". Most dishes will cost approximately 150-300THB (5-10USD). In business for 25 years, Akbar serves mostly Indian, Bangladeshi and Pakistani dishes, but there are a few Arabic ones available, too. The food: If Middle Eastern food isn’t really your thing, this place can help out with its wide variety of food from the Subcontinent. The special tandoori mix (B350) and vegetarian thali (B250) provide a good mix of foods in big portions, sure to fill up anyone. If you’re not quite ready to eat that much, the murgh makhani (tandoori chicken cooked in mild spices with a tomato and butter sauce, B180) is also recommended. • 1/4 Soi 3, 02-650-3347, 02-255-6935, 02-253-3479. Open daily 10:30am-1:30am. Who would have thought that a combination of Iranian and Iraqi food would be the main feature on a restaurant’s menu? It is here, and we discovered that you can have the best of both countries. The food: Kebabs and barbecued meats are the main components of this restaurant’s menu: fish, lamb, chicken, ribs and prawns. The restaurant has a bit of a hotel atmosphere as the location doubles as a guesthouse. Try the Iraqi kebab (B160) or kebab with rice (B200). • 8/17-18 Soi 3/1, 02-655-5357, 02-251-8810. Open daily 9am-3:30am. Like its neighbor Akbar, MehMaan serves Indian, Pakistani and Arabic food in a dining room featuring a giant picture of the late Yasser Arafat. The food: If you feel hungry enough to eat one of the horse statues outside, perhaps the tandoori sampler is for you: It contains a number of assorted kebabs and comes in small (B340) and large (B650) sizes. Also popular are the lamb vindaloo (B250), chicken tikka masala (B220) and the ubiquitous garlic naan bread (B50). • 69 Soi 3, 02-253-4689. Open daily 10:30am-3am; 5:30pm-12:30am. Shisha is hot at the moment, and this is one place in the area where you can come and smoke to your heart’s content. Just don’t tell your significant other that you’re “going to use a hookah.” They might misunderstand. The food: Where else can you find an Egyptian restaurant that is open 24 hours every day? You can drop in for a few puffs of shisha while you relax and watch the world go by. • 4/8 Soi 3/1, 02-655-3043, 02-255-7107. Open 24 hrs. For Thai food we have rice; for Arabian food there is naan bread. The cooking area is at the front, and you have to walk past a clay oven—where bakers are baking naan—to enter this little Lebanese eatery. The food: In addition to Lebanese dishes, there are also many Arab and Yemen specialties on the menu. Chicken curry (B150) is especially good when combined with fresh bread. The slowly cooked naan, baked to be crisp outside and soft inside, brings out the best of the flavorsome spices that are present in the curry. Many lamb dishes—such as lamb kebab (B130), barbecued lamb, and lamb ribs (B150)—are also popular. • 75/4 Soi 3/1, 02-655-5230, 02-254-9226/-7. Open daily 8am-3am. With a display case full of animal parts (including various organs), and, if you arrive early enough, skinned lamb carcasses hanging from hooks, Shahrazad is hard to miss. With arguably the best food in the area, Shahrazad is also known for its waitresses in matching green hijabs and prayer room upstairs. The food: Start your meal off with some Middle Eastern appetizers: hummus (pureed chickpeas with sesame seed paste, B80), mutabbal (a.k.a. babaganoush, pureed eggplant with sesame seed paste, B80), lemony parsley and bulgur wheat salad (B80) and hot-from-the-oven naan (B20). For heartier appetites, try the leg of lamb (B200), the lamb chops or anything else made of lamb—it’s all excellent, tender and not gamey. For the daring, try heart, head or testicles (and let us know what they’re like). For dessert check out the Arabic custard (made with fresh milk, coconut and almonds, B70). • 6/8 Soi 3/1, 02-254-7392/3, 02-251-3666. Open daily 10am-3am. There are several—at least three—dedicated shawarma stalls (as well as restaurants that serve shawarma). 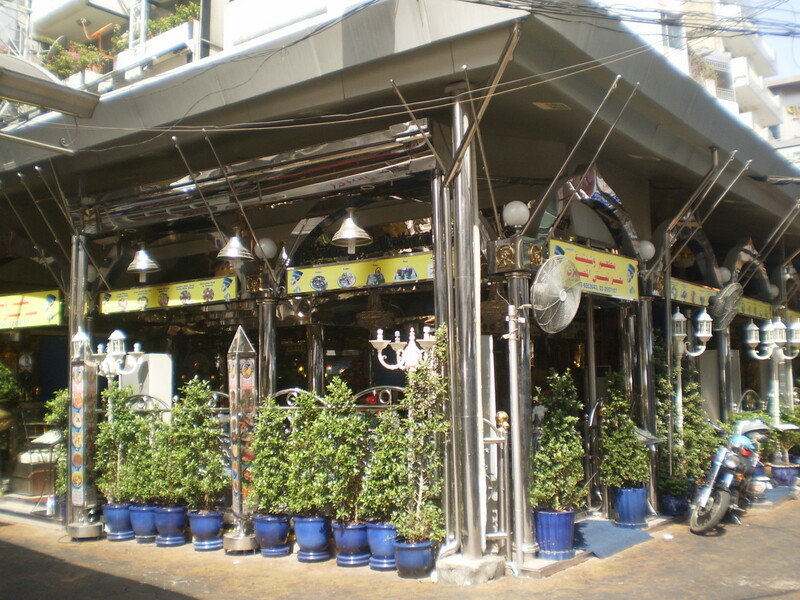 By far the busiest and the best is on the corner of Soi 3 and a Soi 3/1 subsoi, next to the Grace Hotel. It’s loud, hot and stressful, and you’ll probably end up sitting next to some questionable characters (if you can get a seat), but well worth it. For B50 you get a choice of grilled beef or chicken in flatbread with veggies and your choice of yogurt or chili sauce. (You can also get it with the bread on the side.) A tip: place your order in Thai and you’ll get faster service. The above-mentioned stall is a nighttime affair, so if you want your shawarma for lunch, try the shop next to Nefertiti, which serves them from 11am. They actually open at 7am serving a selection of Thai food. Slotted into a small niche between Arab eateries is this small but cozy restaurant that is good for a quick meal of halaal Thai food. The food: Thai dishes such as tom yum goong (B110), pork and chicken fried rice (B60), and grilled fresh fish (B180) are the most popular. • Next to Petra Restaurant, 08-1859-0418. Open daily 10:30am-1am.